Educated in St Anthony's Convent, Mother Natalia taught me Catechism in my secondary school days, but because of parental objection I was not baptized. However, God would not deny me the gift of faith. Mother Natalia's bubbly and joyful spirituality left a deep impression that planted in me the seed of a religious vocation. Later, working as a trained nurse I felt an aching emptiness and sought something deeper, more spiritual and fulfillment. A Catholic friend invited me to pray to Our Lady at Novena and after 6 years, my family accepted my conversion and I was baptized by Fr. Myers on 22nd August 1982 – Feast of Queenship of Mary. The call lingered... then, I made a grave mistake at work and started going to Mass every Friday for discernment. Two months later, my staunchly Buddhist sister Jenny, dreamt that I told her I wanted to become a nun. That shocked me as i had not told anybody of my desire nor my inner struggle. This episode affirmed that God was calling me. At an ordination ceremony, the prostration, an act of total abandonment shook me to the core and I felt the Lord telling me to surrender myself unreservedly to him. I was ready to say “Yes” then and the final prompting came through my niece who said, “Opportunity knocks once but not twice.” At this, I joined Canossians on 2nd February 1986 after working for 20 years. It was painful and difficult moment for me to see my mom and nephew crying when I left home. Six months later, I began my 2 year novitiate training. During my second year, my youngest brother decided to become a Buddhist monk in Thailand. My poor mother couldn't understand why her two children wanted to go away, but a friend who used to work at St Anthony's Convent told her it was a blessing. Her words touched my mother and her attitude changed and she had been supportive ever since. On the day of my perpetual profession, my mother was the most excited person. 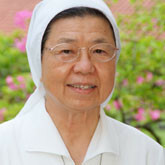 My training as a nurse enabled me to serve Him as Canossian Sister in St. Joseph's Home for the Aged. The Home has a hospice and I see how God's plan for me unfolded. God knew my training as a nurse would serve to ease the pain of the elderly and the terminally ill and how my faith and sense of mission as a Canossian would be a spiritual comfort bringing the Love of Christ to them. The final proof of God's Divine plan for me to unveiled itself in April 1996 when I had to nurse my own father at the Home for terminal cancer. God's blessing and grace prevailed as my father endured the last few months with minimal discomfort. What was most beautiful and miraculous was his reconciliation with himself and his loved ones and his conversion to Catholic faith. His conversion and peaceful death was the strongest testimony to my family members of Christ's love for us.